Still life photography is traditionally a photograph of inanimate objects, often fruits, table settings, usually in small groupings. Sometimes the idea is to accurately document the objects as we see them. Other times the subjects of the photograph are there to create formal compositions about light, shadow, form, texture, line, etc. The photographer is able to select all of the elements of the photograph including the subject matter and the background. Lighting is critical in still life photography. 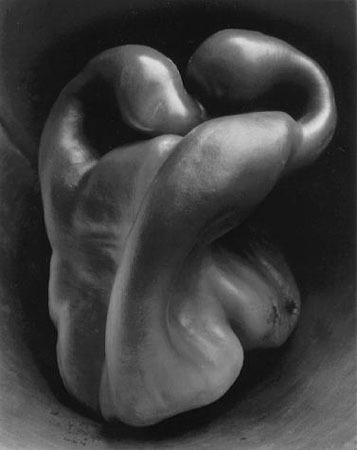 Here are some examples of photographers to research: Edward Steichen, Edward Weston, Paul Strand, Jan Groover, Man Ray, Karl Blossfeldt, Florence Henri, Irving Penn, Barbara Kasten, Paul Outerbridge, Imogen Cunningham, Josef Sudek & Zeke Berman.